Description: It is a creeping herb with small, rounded, kidney-shaped leaves with bluntly toothed margins. The plant bears inconspicuous small, purplish flowers near the bases of leaf stalks. How to Grow: The plant spreads quickly and only a few seedlings (about five) are required in the beginning to fill the allocated space. A bed size of approximately 50 x 30 cms is enough for the home herbal garden. It also comes up very nicely in shallow rectangular pots of the size 50 x 30 cms or shallow circular pots of 40 – 50 cms diameter. Care regime: Mandukaparni is a plant of moist and marshy localities and as such requires the bed or the pot mixture to be kept moist all the time. The plant, therefore, demands watering every day. Collection: Mandukaparni is a fast growing plant and, if maintained properly, can yield adequate harvest for day-to-day use. 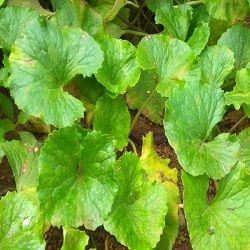 Mature leaves of the plant can be plucked with hand. Trailing stems can be used as further propagation material.